London query: Is Alfred Mews in Fitzrovia? If not, what’s the name of the hood? Here it is on Google Maps if it helps you make your own decision. I’d concur with those saying Fitzrovia is west of Tottenham Court Road. Maybe Bloomsbury but I’d say “just off TCR, next to Heals”. Lots of little bits of London just don’t fit comfortably into named areas and it sounds weird to shoehorn them in. The OED agrees with me about Fitzrovia (“A Bohemian area of London around Fitzroy Square, west of Tottenham Court Road”) but Wikipedia puts the area’s eastern edge at Gower Street. That’s the thing about these areas — they blend into each other and their boundaries vary for different people. And getting it “wrong” can smell weird. Like so many parts of London, and other cities, some locations aren’t clearly enough within a specific area for their neighbourhood to be a helpful descriptor. For this reason I wouldn’t refer to Alfred Mews as being in either Fitzrovia or Bloomsbury or any other area. To me it’s on a boundary, or even an overlap between the two, and so using one label or the other would feel less helpful than saying “next to Heal’s”, or using some other concrete marker. Why be more vague? 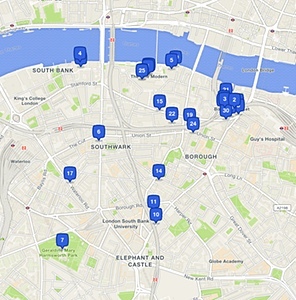 I think Foursquare have stopped using these now — most recent check-ins are located in the less confusing but not-much-more-helpful “London, Greater London”. Before I searched for them I could guess where a few are, but others are baffling. For example, Wick must be Hackney Wick and Northcote is presumably around Northcote Road in Clapham. Of course, it’s possible that other people use some of these terms on a daily basis and they’re only unfamiliar to me (presumably Lord Rogers of Riverside knows exactly where the boundaries of Riverside are). But describing an area around the South Bank, Southwark and Borough as “Cathedrals” seems very peculiar to me. I’m curious as to where these names come from. I thought it might be Quattroshapes, Foursquare’s “authoritative source of polygons around a curated list of places” but I can’t find a way to easily browse that data. And even then, where does that data come from? Maybe someone reading this knows the origin of these place names? I’m not saying Foursquare have done a terrible job with this stuff; I’m saying that this stuff is really hard. For purposes like this it’s useful to be able to describe a small and well-defined area and frustrating when such descriptors don’t exist. London has plenty of existing well-known names for areas but they’re not all useful. Some are well-defined and a usefully small size, such as Soho and Fitzrovia (leaving aside quibbles about their precise borders). But others are less helpful. I could say “Let’s meet in Hackney” but where would I mean? I’d be thinking of somewhere not far from, say, Mare Street (itself pretty long). 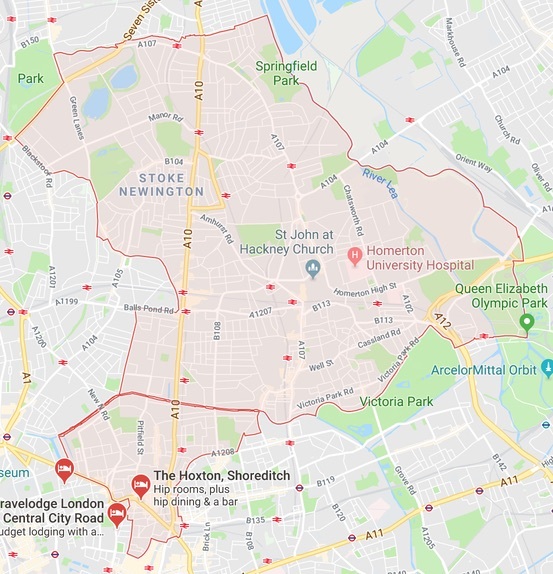 But the legal boundaries of the big London Borough of Hackney (pictured) also include areas like Stoke Newington, Dalston, Hoxton… plenty of other neighbourhoods that are more useful in their specificity. And so I can sort of understand why sometimes organisations attempt to define and promote new areas. 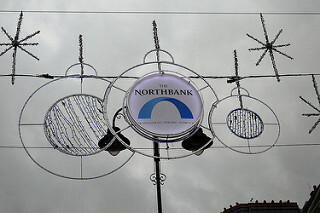 There’s an effort underway to brand the area of “Northbank”, the logo of which helpfully includes the locations “Trafalgar Sq, Strand, Aldwych” so that everyone knows where it is. [Photo by Matt Brown, used unchanged, under a CC license“Midtown”, “encompassing Holborn, Bloomsbury and St Giles”. 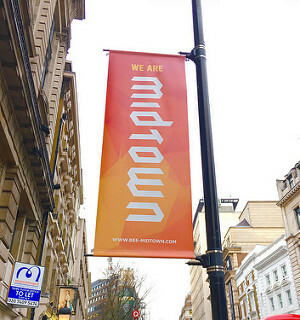 Like Northbank, Midtown is a Business Improvement District and was once focused solely on Holborn (“inholborn”) before expanding to become “inmidtown” and now “Midtown”. Often these BIDs have generic names to describe the areas they cover (e.g. “The New West End Company”) which is fair enough and I assume they serve a useful purpose. But Northbank and Midtown both sound like they’re trying to enforce a change of name from above. Which seems extra strange, and not useful, when these are larger than the existing areas they include. But I know nothing of branding and marketing or government funding. I guess those old, messy districts of Holborn, Bloomsbury and St Giles are a bit too vague or old-hat for today’s bizniz. Bloomsbury may have a distinct brand but maybe it’s the wrong one for “the go-to place for businesses in London”? St Giles has been undergoing a resurgence — while it was once a distinct parish, for the time I’ve lived in London it seemed to me like a lost corner of the past, squeezed out by New Oxford Street and Centrepoint. With the arrival of the attention-seeking facades of Central Saint Giles it seems more noticeable again. Another one for the power of branding. Although I love the area of Holborn, a loose strand stretched between the City and the West End, it’s also vague as a precise location, distended by its eponymous streets: it’s over a mile from one end of Holborn Viaduct in the east, along Holborn, and to the far end of High Holborn in the west. But until 1965 Holborn was a more identifiable Metropolitan Borough with its own town hall and legal boundaries. So why festoon it with “WE ARE midtown”? It feels ludicrous to try to create a new area with a top-down branding effort. And yet… maybe if they can persist with this longer than you might imagine, perhaps in 20 years people will be arranging to meet in Midtown before heading to a theatre in Northbank. Names come and go. After all, Fitzrovia itself is less than a century old, although being named by an artist or a poet feels more satisfying than by a “business led partnership”. 03:02pm: @phl Don’t they? Like, they could fit right in if London was expanded to fit some new bits in the middle.